With construction of the building nearing completion, The Broad offered the public an unprecedented glimpse into the unfinished museum on Sunday, February 15, when two temporary art installations activated the expansive third-floor gallery designed by Diller Scofidio + Renfro. For one day only, visitors were able to see The Broad’s vast, column-free third-floor gallery in its raw state, before the art walls are put in place for the museum’s opening on September 20, 2015. Artist BJ Nilsen’s sound installation DTLA, drew on the aural environment of Los Angeles. 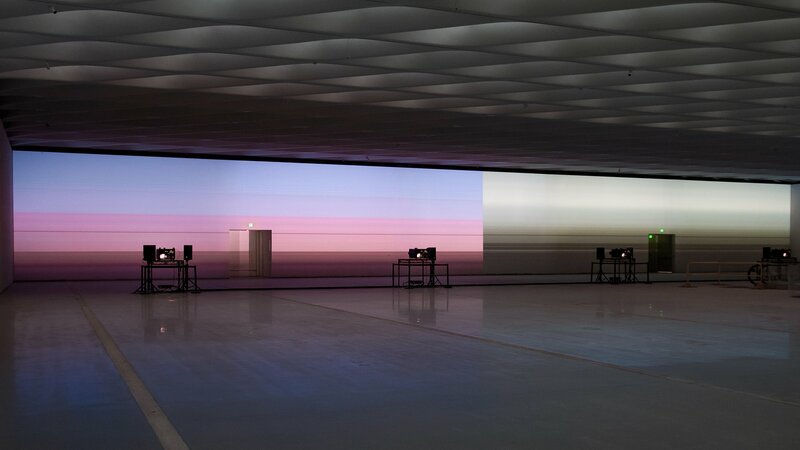 Just as The Broad’s porous architectural “veil” subtly interweaves natural light and glimpses of the urban streetscape of Grand Avenue into its galleries, Nilsen brought the soundscape of downtown Los Angeles into The Broad. Stillness, the second installation featured as part of Sky-lit, was activated after dark, and was a sound and light work by Los Angeles multidisciplinary artist Yann Novak. Stillness created an immersive environment for reflection, inviting visitors to contemplate the effect of climate and light on their physical and emotional states.